Members of the Alabama Road Builders Association at ARTBA’s offices. 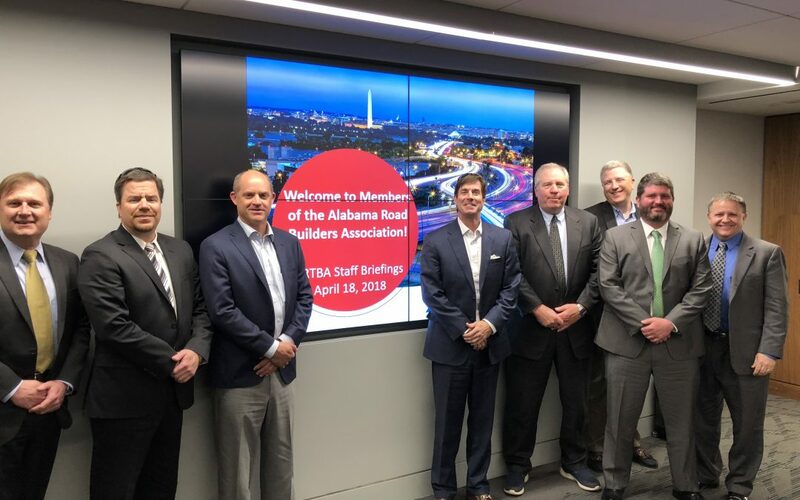 Members of ARTBA’s Alabama chapter affiliate, the Alabama Road Builders Association (ARBA), visited Washington, D.C. April 18-19, to meet with their congressional delegation on pending transportation policy issues. Attendees included ARBA’s Executive Director Tom Layfield; Board President Jay Corley of H & L Construction, Inc.; Vice President Michael Weaver of H. O. Weaver & Sons, Inc.; Treasurer Michael Terrell of Scott Bridge Company; and Secretary Jeff Webb of Ozark Striping Co., Inc. The group stopped by ARTBA’s offices for briefings from senior ARTBA staff about current legislative, regulatory, policy and market issues. ARTBA encourages other affiliated chapters and members to bring groups to Washington, D.C. The association can provide briefings on the latest industry news and trends, schedule visits with policymakers, and host receptions at our offices, which are conveniently located near Capitol Hill. Please contact me at arose@artba.org for more information.